Unfortunately, university isn’t all free time and leisurely afternoons, even if, like me, you decide to do an arts degree. You are there to learn after all. 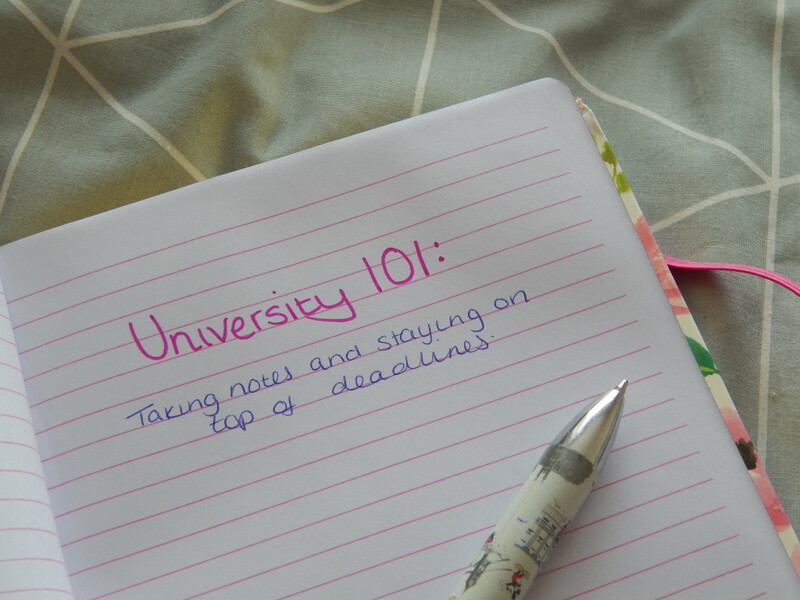 You’ll probably have a mixture of lectures, seminars and tutorials to attend, as well as deadlines to work on. Depending on your degree, they might include things like essays, lab reports, research projects or the dread-inducing dissertation. My degree is in Classical Studies and English. I spent a lot of time doing independent study, working on essays or in seminars. I did have lectures and tutorials in the first half of my degree but not so much towards the end. It made that I read a lot of books and made a lot of notes. Towards the end, I’d even like to think that I wasn’t that bad at it. It took me a little while to find out worked best for me but when I had settled on a routine it made things a LOT easier. It helped me keep organised and on top of everything, which are pretty vital when so much of your studying is self directed. Of course, this might not work for anyone else but I thought I would share it with you in case it can help. Before we get started, however, I should probably warn you that this has turned into a bit of a mammoth post. Go grab yourself a cuppa and get stuck in! I did 90% of my notes for university on pen and paper. I tried bringing my laptop with me but I quickly realised that I was getting too easily distracted. Most of it was class related but I was constantly googling terms I didn’t quite understand or wanting more detail on something. Before I knew it, I had missed something by ‘researching’ other things. A lot of my seminars were really fast paced so I didn’t really have time for any tangents. Instead, I just took as many notes as I could in class. There was very rarely any full sentences. I would use arrows to add extra notes in the margins or make connection between ideas. I’d use colour to highlight key points or things I wanted to come back to. It was a little messy and probably didn’t make sense to anyone but myself but it was effective. However it’s quite difficult to study from a notebook that looks like that. Trust me, I tried. As such, I would type up my notes once a week. I would expand on my sentences, add definitions for words I didn’t understand and clarify any areas that needed extra information. This would all end up in a master document and I had one for each of my courses. I could then use this master document as a revision guide when exams were drawing near. It also had the added bonus of making me review the content once a week, which meant that it was easier to recall when I needed to. By the time I started revising, I had already covered the content twice! As you can see, I’ve left my weird jokes and anecdotes in because I find they help me remember things a bit better but I’ve also expanded the information considerably. It’s still in my own words but it makes a lot more sense if I’m revisiting the content after a little break. I’ve also added some scholarly opinion that is related to the topic so that I can find that when I’m revising for an exam. It’s a little extra work but doing it weekly means that I don’t have quite so much to do when it comes to revision. I can dive right in without having to worry about deciphering my notes or trying to get them into a logical order. I’ve already done all that throughout the term! 3 days of reading (both primary and secondary) and plenty of note taking. I find this pretty tiring so I would do a couple of hours each night rather than trying to sit down and do it all once. 1 day of collating all of that research into a more formalised essay plan and condensing my notes/ quotes to things that are strictly relevant to my argument. 3/4 days of writing. This is something else that I find difficult to do in bulk so I would aim for somewhere between 500 and 750 words when I sit down to write. I would reference as I went but wouldn’t worry too much about keeping them tidy just yet. 1 day of walking away. Yep, a whole day not thinking about the essay you just wrote. This is the step that’s the easiest to drop if you’re feeling rushed but it’s also the one I find the most useful. A little time away really helps with approaching your essay with a more objective eye. 2 days of editing and proofread. Once I’ve had a day not looking at my essay, I would get stuck in with the nitty gritty work. I would get out my bright pen (usually pink) and see which parts of my work weren’t as strong as others. I would then rewrite these bits, as well as fixing any typos that I found. I’d then tidy up my references and check they met the department’s standards. Finally, I would format and proofread my work again before I submitted it. If you can, I also found it useful to have a second set of eyes on your work so would ask a housemate to check over it before I finally submitted it. It might seem a little OTT but its all too easy to lose marks over things that are easily fixable. Sometimes, you’re expected to work on projects a little longer or more time consuming than a standard essay. For me, this was things like research projects, literature reviews and, of course, my dissertation. It’s easy to get overwhelmed when working on something like that. I would use a similar schedule that I would use to write an essay but just extend each section accordingly. I would also be careful to pace myself. I didn’t write the 10,000 words for my dissertation in a day but over a couple of weeks. I made sure to break it into chunks to make it easier to manage. Not only did I focus on one chapter at a time, but I also made myself a word count checker to keep track of my progress. It was super simple and just a word document on my computer, though surprisingly effective. I would simply mark off every 100 words that I had written. 10,000 words doesn’t seem as intimidating when it’s broken down like that. Before I knew it, I had the first 500 words, then the first 1,000 words and finally, a complete first draft. When it came to research, I would make myself a schedule to make the task look a little less daunting. When working on a paper on Gothic literature, for example, I knew I would spend a week on Dracula and vampires, another week on Wuthering Heights and a third week on the literary tradition. It gave me a focus that in turn made my work ethic a little more sustainable. Rather than trying to learn everything about the Gothic genre at once, I had smaller tasks that I could use to tailor my reading for the day or week. Breaking the work down into more manageable chunks and having a way to see the progress you’re making is a great way to approach larger projects, whether at university or otherwise. It can make them seem so much less daunting than they first appear, which is a good thing in my books! As I said, my techniques were very closely linked to my degree itself and the amount of reading I had to do for it. I spent a lot of time researching independently or in fast paced discussions in my seminars and had to adapt the way I worked accordingly. These tips might not work for you but hopefully you can still find some nuggets of advice in them! If you have any tips, please do share them in the comments for everyone to see too.